One of my biggest disappointments with Skyward Sword was a sense that the game held my hand too often. Skyward Sword felt to me like one of those games where the tutorial never lets up; my sense of agency and freedom as a player felt stripped away because I felt like too many puzzles were explicitly explained to me either by Fi or the camera zooming to an objective. I want to be challenged, but I also want to have some idea of what I have to do in order to progress. A fine line exists between telling me what an item does, and a magic ghost woman flying out of my sword to explain exactly how I need to use an item the moment I enter another room… before I even see the puzzle, let alone get a fair chance at solving it. All of this has prompted me to ask, which Zelda game is the most annoying? Which one has the most or least handholding? Will Zelda U feature another companion holding Link‘s hand through every step of his adventure like a concerned mother hovering over her child at a playground? Obviously these questions and more could be answered in a simple opinion piece. But the Internet is already in no shortage of people expressing their opinions about Zelda games. This website is proof of that. So, I’m going to do something more unique and more objective. An audit that consists of a full playthrough of the last five Zelda games that appeared on home consoles (Ocarina of Time, Majora’s Mask, The Wind Waker, Twilight Princess, Skyward Sword, excluding OoT‘s remaster: Ocarina of Time Master Quest) and keeping track of how much handholding each game features and how annoying each game can be. Obviously, the very notion of handholding is subjective; a tutorial that is helpful to one player can be a hindrance to another. To get around this, I will classify certain things in the game that could be interpreted as handholding, and count how many times each one happens over the course of an entire playthrough of each game. I’m currently over 20 hours into my playthrough of Skyward Sword, and will provide statistics based on my criteria below, and follow up every week with either an update on my progress in a game and my impressions so far, or an overview of how the playthrough went, complete with infographics to ogle and spreadsheets to ponder. Readers can expect updates from me every Sunday from here until the completion of the audit. If all goes well, the completion of this audit might provide some valuable insight into what expectations we should harbor for upcoming Zelda titles, as well as an objective insight into decade-old debates and misconceptions. For those of you curious about the nuances of how this audit will be conducted, read the section below. I will conduct what I consider to be an average playthrough of every 3D Zelda game to appear on home consoles, excluding re-makes, ports, and games that break the traditional Zelda mold like Four Swords and Hyrule Warriors. I consider an average playthrough to constitute completing the game’s main story (beat the bad guy, save the princess) with some pursuit of side quests, though finishing every side quest is not required. Gameplay Interruption (GPI) — Moments in a Zelda game when player control is interrupted unexpectedly. 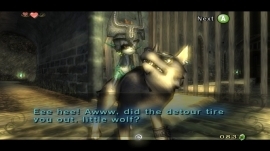 A GPI does not include moments when Link engages in conversation, or a cutscene initiates, but a scenario where the player is moving Link and control is suddenly suspended so that a character may talk to them or the camera pulls away to focus on something else without player input will be counted. One GPI happens in Twilight Princess, when Link visits Hyrule Field for the first time and the Postman suddenly calls his attention and runs over to greet him. Another example is found in Ocarina of Time where Link’s first attempt at entering the Kokiri Shop in Kokiri Forrest is interrupted by a Kokiri who is perched atop the shop’s awning and teaches the player about conversations with Z-targeting. Companion Gameplay Interruption — This is a GPI that is caused directly by Link’s companion, be they Navi, Midna, or someone else. The same rules apply: a Companion GPI will only be counted if player control is unexpectedly suspended, and in this case, only if their attention is directed toward something their Companion has to say. Companion GPIs are meant to be a subgroup within GPI count, not its own unique count. As a result, instances of a Companion GPIs will also add to the tally for GPIs. player is low on health could be considered a Chime, but in order to not unfairly inflate this counter, (and taking into consideration that the number of times each player will experience a low-health state in a full playthrough will vary widely) low-health alarms will not be included in this counter, nor will Fi’s alerts about low shield integrity or Wii Remote battery life. Camera Movements — These are radical shifts in the camera’s movement, expected or otherwise. Suppose Link steps on a switch that opens a door. If this action causes the camera to focus on a close-up of the door opening (and the player looses control of Link), that will be considered a Camera Movement. Zooming in on Link to show him holding up a newly acquired item is not included in this count. If Link enters a room and then, under player control, takes a few steps forward before the camera suddenly turns and zooms in on an enemy or a puzzle mechanic while temporarily suspending player control, this will be counted as both a GPI and a Camera Movement. If the camera focuses on a switch the moment it is activated, it will count as a Camera Movement but not as a GPI because the “unexpected” element of a GPI is missing. Redundant Information — A tally will be added to this counter every time redundant or extremely obvious information is stated. Information a veteran player is already aware of will obviously not be counted here, but an instance when one character says something followed by another character explaining the exact same information only stated in a different way will be counted. An example of this can be found in Skyward Sword when the first Kiwki Link encounters explains that Zelda is in danger, followed by Fi jumping into the scene and basically repeating the same information the Kiwki just said. This counter will also include instances when information the player should already be aware of is repeated too many times, resulting in an, “I already knew that” response from the player. Frustration — This counter keeps track of every time I feel particularly annoyed during the playthrough. Yes, this counter is extremely subjective, and will not be given nearly as much weight as the other counters when determining which game has the most handholding, but nonetheless, it is included in this audit for those interested. An example of Frustration would be an abnormal spike in difficulty where the solution to defeating an enemy or solving a puzzle is too poorly explained, or instances when tutorials feel like they go on for far longer than they are needed. Joy — This counter keeps track of every time I feel particularly pleased, satisfied, excited or otherwise filled with especially happy feelings during the playthrough, and is intended to balance the Frustration counter. Like the Frustration counter, this counter will rely on very subjective information and will not be given as much focus when determining which game has the most or least handholding, and it should not be an indication of which game is the most enjoyable. An example of Joy would include interactions with characters that were especially funny or emotionally engaging, as well as the satisfaction felt after a particularly exhilarating enemy encounters, or a sense of delight felt when appreciating a new game mechanic or fun-to-complete puzzle. Spontaneous instances of Joy that are unlikely to occur during an average playthrough (initiating a Fatal Blow on a Cursed Bokoblin near the edge of a cliff caused Link to overshoot his target and fall to his death, making me lol) will not be included counter. Cutscenes — While rarely a source of player frustration or annoyance, Metal Gear Solid has taught me that too much cinematic exposition is a very real thing. While no Zelda game is as cutscene-heavy as any recent work by Hideo Kojima, a tally of the total number of cutscenes in each game will be kept for the sake of comparison. Cutscenes are characterized by unique character animations, cinematic camera movements and positions, exposition of events outside the player’s view or access, and prolonged exchanges of dialogue on-screen with minimal player input. In addition to these counters, gameplay time will be kept track of as closely as can be managed, and an attempt will be made to show which counters were added to during which event in each game, so that each inter-dungeon stats can be compared as well as inter-game stats.